Kudos to 18-year-old pianist and music entrepreneur Naoko Sakata. Along with a team of peers, her “Musicians’ Dream Aid,” founded in 2015 as a Canadian charitable organization, supports other young musicians needing financial support to pursue their music education. “There are many young musicians with talent and dedication whose families are simply not able to afford it,” she says. Sakata is finishing her studies at the Taylor Academy of the Royal Conservatory of Music in Toronto before heading off to the Conservatoire de Musique in Quebec City. She hopes to pursue piano pedagogy in addition to continuing Musicians’ Dream Aid and establishing other service projects. Musicians’ Dream Aid provides two annual scholarships for Canadian students or those studying in Canada. These are funded by donors and through ticket sales at MDA concerts. Last year, a composer’s competition was offered by MDA; this year, a performance competition is in the works. Sakata recognizes the challenges she’s taken on in creating her own organization. The biggest takeaway? “In order to get opportunities, you have to take action and create them yourself,” she acknowledges. “Before starting MDA, I performed in concerts and participated in music competitions, but I did not do much that would be considered unusual for a serious music student. Visit MajoringInMusic.com’s Scholarships page for a link to Musicians’ Dream Aid. 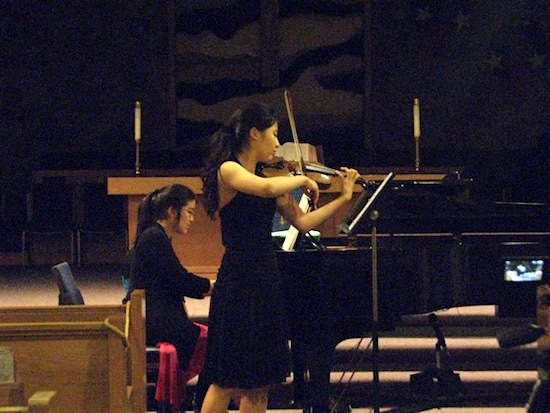 Photo: Violinist Ruth Kim performs with Naoko Sakata at the second Crescendo concert in 2015.